Customers love React datagrid component by ag-Grid for its wide array of customization options. At ag-Grid, we believe that developers should be able to easily extend default functionality to meet their business requirements. That’s why most of the functionality of our React grid is already component based. You can easily extend the default functionality by creating your custom React components and integrating them into the grid. In the previous article on how to get started with React grid, we’ve integrated ag-Grid into the React application. If you haven’t worked through the tutorial in the article and so don’t have a sample application now, you can download it from this GitHub repository. In this tutorial, we’ll extend the default filtering, editing and rendering functionality available for the column “Price”. To do that we’ll implement a custom filter, cell renderer, and cell editor. And we’ll have it all done in less than 10 minutes. Here’s what we’ll add to our React grid. Ready to get started? Let’s see how we can do it. You can download the sample that we’ll be building in this article from the GitHub repository. You can customize our React grid component through custom React components. Besides the render method responsible for defining UI these components will also need to implement some methods called by ag-Grid. For example, a cell editor should implement the getValue method that ag-Grid uses to request the value from our component and update the data. A custom column filter should implement the doesFilterPass method that processes values and so on. Interfaces described in the docs define these required methods. As we go through the tutorial, we’ll get familiar with some of them. The job of the grid is to lay out the cells. By default, the grid will create the cell and render values as simple text. If you want more complex HTML inside the cell or need to customize the value before it’s rendered, you can do it with a custom cell renderer. In this tutorial, we want to format our number according to a user’s locale, so that’s the use case for a custom renderer component. This renderer will take advantage of the built-in function toLocaleString to format values. To implement the renderer we first need to implement a React component. It will receive the value of a cell through React props. We will render the formatted value inside a simple span HTML element. It’s a simple component with just one method render that returns a span element containing the formatted text. Our React Grid provides rich editing capabilities. It resembles a spreadsheet allowing you to edit data inline. Just press F2 or double-click on a cell and ag-Grid activates the edit mode. You don’t need to provide a custom editor for simple string editing. But when there’s a need for custom editing logic we need to create our cell editor. Note that I’m using the React.createRef mechanism that is available in the newest versions of React. Check out the documentation to learn how you can do this in previous versions of React. 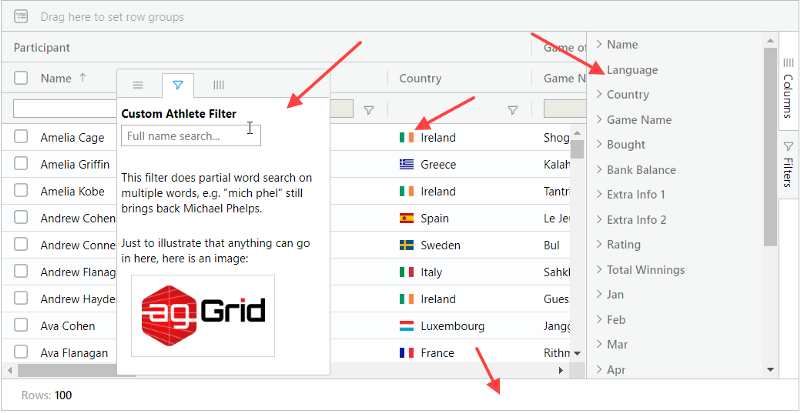 Filtering is one of the most useful features of data grids. It allows users to zoom in on a particular set of records. Our React grid provides a simple string filtering out of the box. But when you need your custom filter types, custom filter components is the way to go. The component we will be working on provides capability filter out cars based on a price range. Next, we need to implement the doesFilterPass method that performs filtering. It’s called by ag-Grid to determine whether a value passes the current filtering condition or not. We also need to implement the method isFilterActive that is used by ag-Grid to determine whether the component has any filtering condition to apply. Notice that we also receive the valueGetter function through component props. It’s the function provided by ag-Grid to retrieve the current value of a cell. Build Your Own React App With ag-Grid! I hope that the examples above provided a clear illustration of how easy it is to customize and configure our React grid. You’ll see it for yourself how fast and extensible the grid is and what makes it the best React datagrid in the world. Learn more about ag-Grid and React. Customers love our Angular datagrid component from ag-Grid for its wide array of customization options. At ag-Grid, we believe that developers should be able to customize the grid easily and implement the functionality to meet their business requirements.